Our product range includes a wide range of 6 blocks making machine - hydraulic - triple viberator. Block Size 8" x 8" x 16", 6" x 8" x 16", 4" x 8" x 16"
We are offering our clients high performing Concrete Hollow Block Making Machine. Fitted with panel boards with easy to use controls and a powerful motor, these machines are designed to produce blocks of various dimensions and in large numbers. 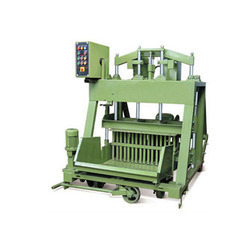 Our machine can produce 8" block in 2 numbers, 6" block in 2 numbers and 4" block in 4 numbers. We are dealing only in South India.